EZ-Rate™ offers a simple, safe, economical and highly-accurate method for performing Westergren ESR determinations directly in 13mm sodium citrate blood collection tubes. 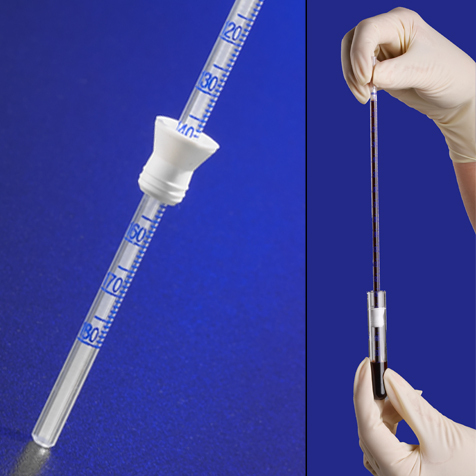 The polystyrene EZ-Rate™ pipette is graduated from 0 to 180mm and features a unique fibrous plug located at the zero mark. The plug is specifically designed to be a self-sealing aerosol barrier that stops hazardous substances from escaping through the top of the pipette. 1. Insert the EZ-Rate™ pipette into the blood collection tube. 2. Using continuous force, push the pipette down to the bottom of the tube. The blood will automatically rise into the pipette and stop at the zero mark. 4. At the end of 60 minutes, the numerical results are read in millimeters directly from the imprinted scale on the pipette.